A few temptations for me tonight but I limited myself to the Energy Bra in Faded Zap because I have a gift card to spend on it. I’m sorely, sorely tempted by the In The Flow Crops in Very Green but I’m just not sure I’d wear them a ton to crossfit, or out casually, or what I’d pair with it… Oh man… I feel like I’m really going to regret passing on them. What did you guys order tonight??? 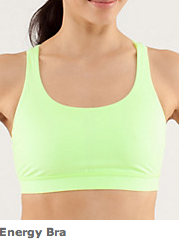 "The Latest: Inkwell Pin Stripe Wunder Unders, Hook Me Up Bra, Beach Runner Jacket and More"